Dr. Sundar Balasubramanian is a Research Associate in the Department of Biological and Agricultural Engineering at the Louisiana State University Agricultural Center, Baton Rouge, USA. 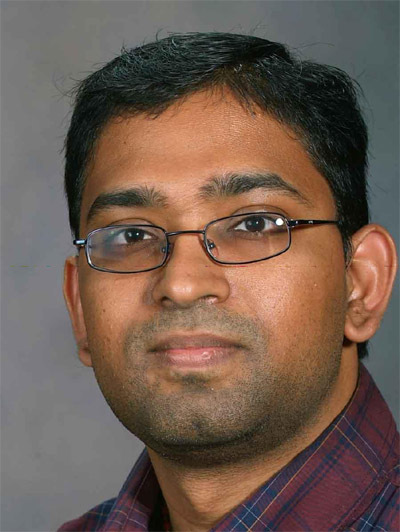 Prior to joining LSU, Sundar had worked as a Post-doctoral Research Associate at the Department of Agricultural and Biological Engineering, Pennsylvania State University, University Park, USA. He specializes in Food Process Engineering and has over 10 years of research experience on various cutting edge food processing technologies like high pressure processing, microwave and ultrasound processing, electronic nose sensor technology and traditional thermal processing. Sundar graduated from the College of Agricultural Engineering, Tamil Nadu Agricultural University (TNAU), India with a Bachelors in Agricultural Engineering. After a Masters in Agricultural Processing Engineering from TNAU, he joined Illinois Institute of Technology, Chicago for a Masters in Food Safety & Technology conducting research at the National Center for Food Safety & Technology. His quest for a PhD in Food Engineering lead him to the North Dakota State University (NDSU), Fargo where he worked at the Department of Agricultural and Biosystems Engineering and conducted research on the development of electronic nose sensing techniques for food safety applications. He was awarded certificate of merit by the College of Engineering, NDSU in recognition of his academic and research efforts. Dr. Balasubramanian is a professional member of the Institute of Food Technologists (IFT) and the American Society of Agricultural and Biological Engineers. He is actively involved as a reviewer in more than 12 international journals, and also serves as a member of a panel of judges in the IFT’s award jury. Sundar is also a contributing member in IFT’s subpanels pertaining to Food Engineering, Food Safety & Defense and Food Processing & Packaging for the 2010 Annual Meeting Scientific Program. He has authored numerous research articles related to high pressure processing for inactivation of bacterial spores, energy reduction during milk and tomato pasteurization using modified plate heat exchangers, electronic nose sensing of spoiled and contaminated meat, sensors for detecting toxins in grains, microwave-assisted oil extraction from feedstock for biodiesel production and microwave treatment of ballast water. He has also co-authored a book chapter on fouling models. Dr. Muyanja has taught Food Microbiology, Food Packaging and Materials, Food Chemistry and Meat, Fish and Poultry Technology to under graduate level. Quality Assurance and Advanced Food Microbiology at post graduate level. He has ability to handle other the food related areas with outstanding competence. He has authored or co-authored a number of scientific publications. His research papers are published in outstanding peer reviewed scientific journals, including international Journal of Food Microbiology, Journal of Food protection, Food Additive and contaminants journal, , International Journal of Food Science and Technology, Food Research International and African Journal of Agriculture Nutrition and Development . Other research papers have been published in regional and national journals. He has presented scientific papers during national and International conferences in countries such South Africa, Kenya, United Kingdom, USA France, Italy, Norway and Hungary. He is a member of the National Codex Committee, Uganda. Member of International Association for Food Protection (IAFP), Member of International Committee of Food Microbiologist (ICFM), Member of Society for Applied Microbiology (SfaM), Member of European Federation of Food Science and Technology (EFFOST) and Member of Uganda National Academy of Science (UNAS). He has trained several rural women groups in Food processing, Food Safety and Food Hygiene. He is a good advocate of HACCP application in small scale food processing industries and consumer protection. Muyanja’s research interests lies in Food safety and Nutrition, Consumer protection, improving traditional fermentations and Food processing technologies. He has a great interest in upgrading traditional fermentation of cereals and their technologies to small scale commercial production levels. He is interested in improving the food safety in food establishments and street food vending enterprises. He has a great interest in Innovation systems and cluster development. He is facilitator in the strengthening of University Capacity for Promoting, Facilitating and Teaching Rural Innovation (SUCAPRI project) Edulink Sponsored, University of Nairobi, Egerton University, Jomo Kenyatta University of Science and Technology, Makerere University, Kenyatta University. Activity 3 coordinator for multistakeholder learning workshops in Uganda. He has organized and trained Food Inspectors from Kampala, Mpigi, Wakiso and Mukono Districts of Uganda in Food Safety and Inspection Techniques, a short certificate Course. Working as professional on the Presidential Initiative for Banana Industrial Development (PIBID), (Research for development and value addition). Have worked as an interdisciplinary team to compile sector profiles of Uganda Investment Authority aim at the attraction of investors in the country. I worked on the Foods and beverages sector. I have worked on the team of Stakeholders to develop the Uganda National Food Safety law. This involved Ministry of Health, Ministry of Trade and Industries, Consumer Association, Uganda National Bureau of standards. I have worked as a stakeholder member to develop the Uganda Fisheries Agency. Have trained Uganda Food Manufacturers association members in areas of Quality Control and Assurance. The course sponsored by Uganda Manufactures Association in conjunction with Midway Technology Ltd, a UK company dedicated to providing assistance to small and medium-scale enterprises. Have trained rural farmers of Masaka Organic Processors (A small scale company exporting dried pineapple slices to Denmark) in solar drying technology, personal food hygiene and food safety. Trained rural farmers of Mityana and Masaka (rural women producing wines and juices) on aspects of personal hygiene and safety (Consulted by ACTION AID Uganda).